Schuim:	wit, grote bellen & wandklevend. Associatie: beta versie van SNAP Maalstroom. Meest voorkomende geuren: Hop, Fruit & Citrus. Meest voorkomende smaken: Citrus, Hop & Mout. ABV:8%, IBU: 80, EBC: 18 , Malts: Maris Otter Pale. Hops: Simcoe, Citra, Columbus, Chinook & Amarillo. Expeccially for the 5 year anniversary of the Beertemple in Amsterdam we were asked to create a awesome westcoast style IIPA. Our answer was the big fat double 5 IPA. With 5 hop varieties and some love the beer got a warm welcome! However, the owner of the Beertemple was so impressed he decited to have the beer as his new house-beer! Eventually it became the house beer of the Beertemple, ‘t Arendsnest & Craft&Draft all located in Amsterdam. 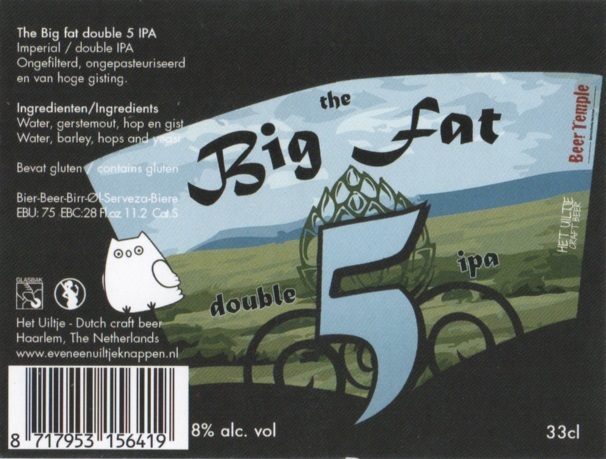 The Big Fat Double 5 was given the Gold medal in the Dutch beer challenge for best Imperial IPA of the Netherlands.